A 14-year-old in Washington state took his parents' SUV to buy fireworks on the Fourth of July without their permission which resulted in the vehicle being torched by a Roman candle, police say. CBS affiliate KIRO-TV reports the boy from Skyway, Washington, commandeered the vehicle on Tuesday. 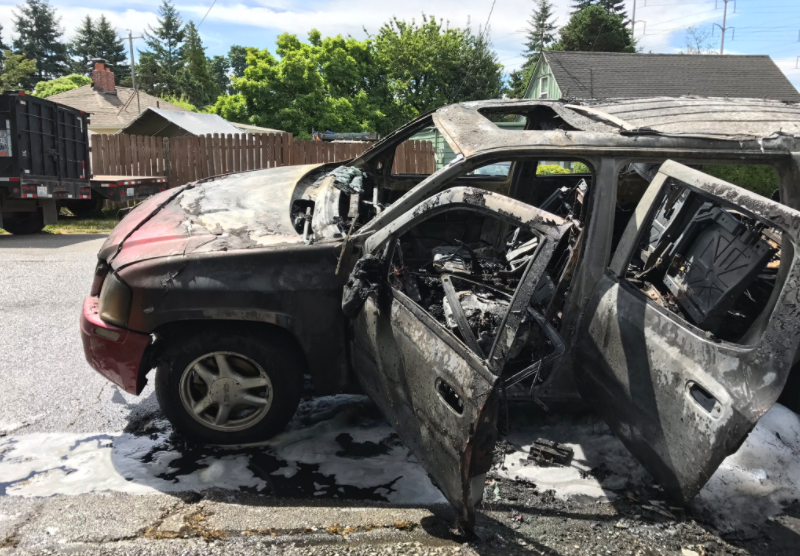 The King County Sheriff's Office said the boy and two friends began firing Roman candles at each other and one of the projectiles went through the window of the SUV, setting it ablaze. Photos show extensive damage to the vehicle. No one was hurt in the blaze and the parents don't plan to press charges, KIRO reports. Firefighters said the incident could have been much worse. "If we had drier conditions, as we'll start to see here shortly, this absolutely could have been not just a car fire, but exposures to two homes that were nearby," Skyway Fire Department spokesman Dave Nelson told KIRO. Firefighters in the area responded to at least five fires overnight as the Fourth of July weekend came to a close.